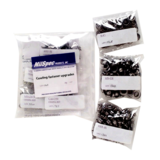 Now you can easily upgrade the old rusty and worn fasteners to the modern standard, MilSpec's C-Spec fastening system! These FAA registered and STC approved kits cover All BeechCraft 33, 35 and 36 models included on original type certificates TC-777 and TC-3A15, years 1957 and up. Upper cowling (UC kits) are for the main engine cowls and Lower cowling (LC kits) are for the lower cheek / gill door panels. After installing one of our kits, your days of cowl fastener frustration are over, permanently. The new set up will be a pleasure to work with for as long as you own the aircraft! The Stainless Fasteners are Precision Machined from Top Quality Stainless for Increased Strength Ratings and Tough Heads that Prevent Galling, Even When Over Torqued! Polished and Passivated Stainless Fasteners with a Finish so Bright and Shiny you will need your Sunglasses! Kits are Available with Slotted Head or Phillips (cross recess) Head Studs. Both head styles feature our proprietary materials and machining methods which insure they will not strip out or gall, even when over torqued giving you many years of unmatched service! Slotted head Kits Use Our Special Enclosed (collared) Slot to Prevent the Screwdriver from Slipping Out and Damaging the Paint. Please select the appropriate kit for your specific year, model, and/or serial number aircraft below. Don't forget about installation tooling. If you need guidance as to which tools may be required for your particular selection, please contact us and we will let you know. We keep all installation tools in stock for purchase or rental.